Just like London buses, after waiting ages for one, two come along. Private investment firm Actis has completed financing on the 100MW Kipeto project in Kenya, for what will be the second wind site in the country. The announcement comes weeks after Kenya’s first wind project, Lake Turkana, entered commercial operations following a long delay on the grid connection. Actis owns an 88% stake in the site that it acquired off the International Finance Corporation and the African Infrastructure Investment Managers. The remaining 12% of the project is owned by local group Craftskills Wind Energy International. It will be located in Kajiado County, immediately south of Nairobi. It will comprise 60 GE Renewable Energy 1.7MW turbines, and supported by a 20-year purchase deal with utility Kenya Power and Lighting when it is completed in 2020. 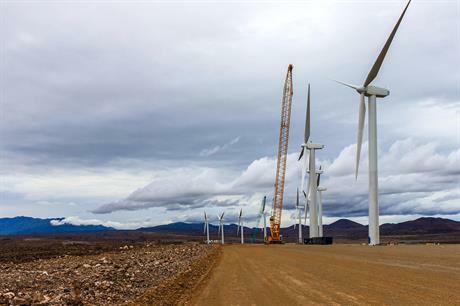 Kenya’s first wind project, the 310MW Lake Turkana site, produced first power in September, 15 months after installation works were completed following delays in the construction of the transmission line. A 17km transmission line for the Kipeto site will also need to be installed, Actis added.